If you have an opportunity show this article to experts to criminalists. 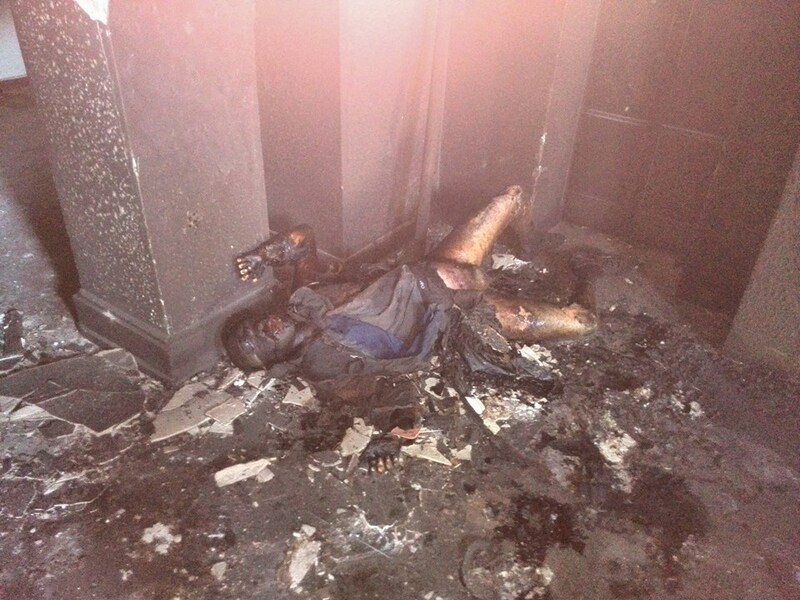 It is already clear that in the Trade Unions Building in Odessa were killed more than 42 people. Provokers carried away people into the building where they could be killed with impunity, with pleasure and without witnesses. The wasn’t any fire in the building — there was a fire statement to write off for it mass destruction of citizens of Ukraine. The post version in English — http://ersieesist.livejournal.com/813.html If you have an opportunity, drop it on English-speaking sites. At first an arson of tents on the square and the organization of a large-scale open flame against the building. 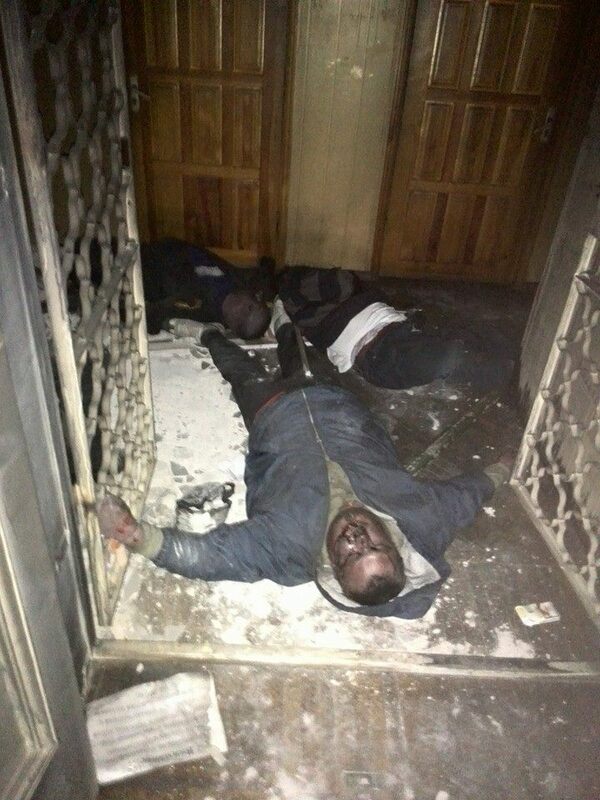 People carried away under protection of massive doors of the Trade Unions Building. 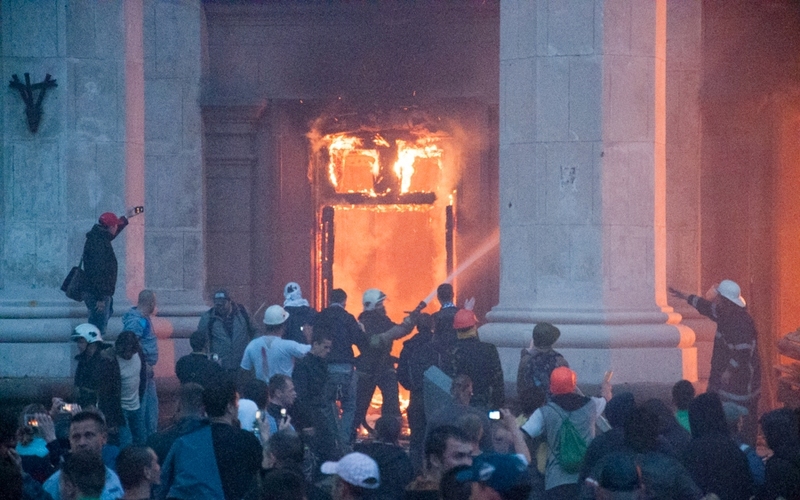 Supporters of federalism on the square had no in advance prepared Molotov cocktails. From where there was a fire in the building? … then at all three. 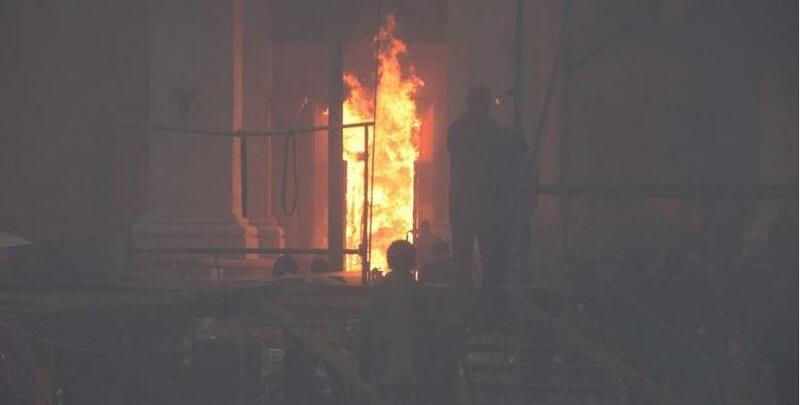 … firefighters arrived when even massive entrance doors already burned down. In the huge five-floor building with ceilings for 3 meters naked flame was in one office. Who could make the way on a roof of an office building of federal value? Likely those who received in advance keys from the locks locking steel lattices, conducting to doors on a roof. These fighters should be found. They could tell a lot of interesting about when the plan for mass destruction of inhabitants of Odessa and as they prepared in advance stocks of gas mixture in the Trade Unions Building began being carried out. On the bottom photo clowns from mass meeting represent supporters of federalism. Typical Hollywood (USA/Israel) a backstab under “others flag”. Completely burned down corpses on the first floor at entrance doors. 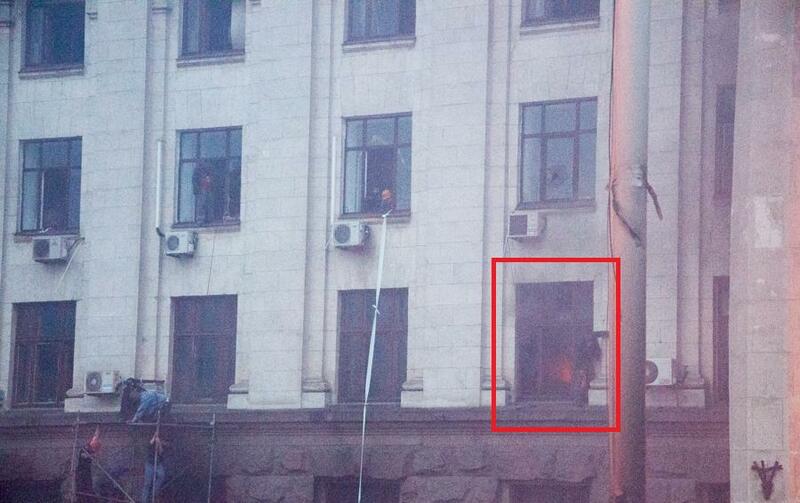 From where the scorched corpses appeared above the first floor — there wasn’t any open flame? - female corpse dragged on a floor from a place of real death. Who and what for? - the man is killed with a shot in the head. Wound through — under the head accumulated. You already paid attention, what at victims the heads and a humeral belt burned down? The clothes from a breast aren’t mentioned by fire below? People watered from above with combustible liquid and set fire. Whether sunglasses on a face when the person tries to shake napalm from the head could remain? Hands and wrists were burned with that to a bone. On this, as well as on the previous photos, strange “white whitewashing” on a floor. It порошёк from fire extinguishers. They were used by chasteners after people perished … that not to burn down or suffer from carbon monoxide. Young man and girl. They didn’t burn down and didn’t choke — there are no signs of naked flame on a parquet (it has about 50 years and it had to flash as straw) and a soot from a smoke on walls. Them killed in a different way. Most likely to both broke necks — professionals had a good time. Barricades were and on floors. Blood on the parquet, the burned-down head. It is quite possible that chasteners changed outerwear with the killed. Familiar counter — simple and effective. The woman at lift mine without clothes is lower than a belt. Most likely her raped, and then poured over the head gas mixture and burned. Killed by shots in the head. 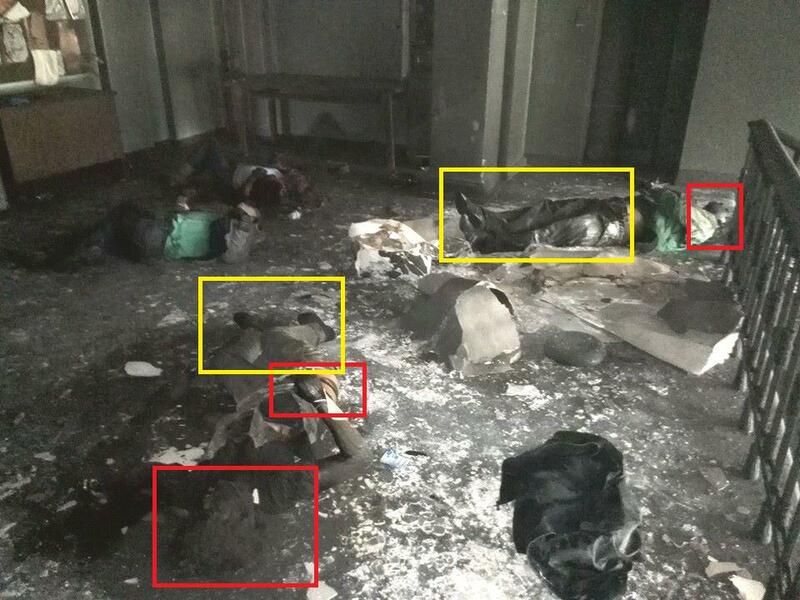 The same picture — the burned heads, hands and a humeral belt, untouched fire the lower part of a body. … murderer. Remember, murderers blue gloves. The Olympic jacket with strips on sleeves. 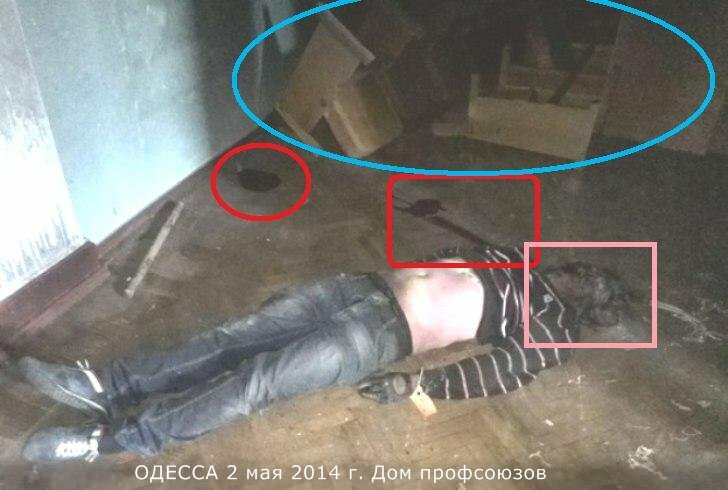 To “patriots of Ukraine” — they point pleasure to the victim, to the murderer and to a crime scene. Future mother and Odessa mother are killed. Ukraine is killed also. 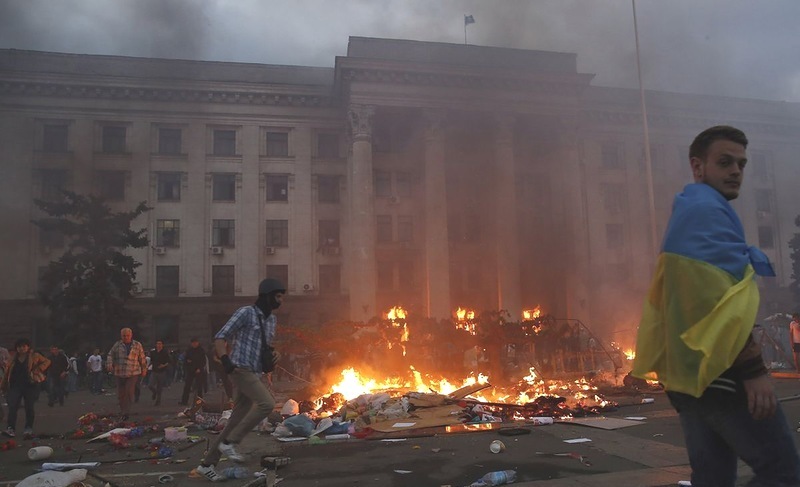 Gradually it becomes clear that about the tragedy which has occurred in Odessa, we don’t know practically anything. We know only the version which is thrown in two options: whether taken cover in the Trade Unions Building правосеки пожгли, whether they itself, on imprudence. Actually, NOBODY didn’t die of smoke. When the quantity of corpses and the people who are in a cop shop became known, inhabitants of Odessa learned that people of “missing persons” were three times more. In the evening to the city “for some reason” there arrived a new portion RightSectors, about two thousand people. It became clear that not to walk children arrived, to be engaged in business. Important issue – to tidy up behind those who was delayed here one day earlier. “Now on the channel told that in the Trade Unions Building cellar still found 160 corpses. 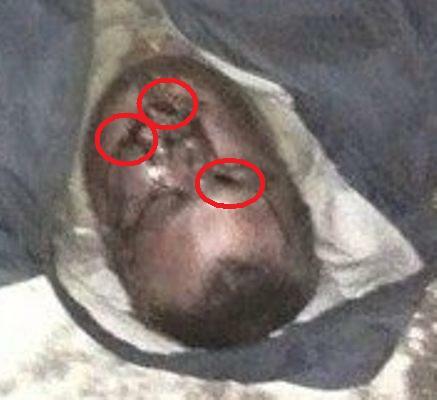 Simply corpses in a cellar. The killed from firearms and killed by axes! ! ! ! there are the children who have run with mothers by the passing! ! ! “Inhabitants of Odessa! My dear! Terrible news. You have more than one hundred people which are registered as missing persons, and you don’t find them in hospitals and mortuaries … It is heavy to me to write it, but they already aren’t present in the live. 126 corpses are in the Trade Unions Building cellar. Them there killed, they didn’t burn. It was Gestapo. For this reason the building is blocked. Now to the city overtook for about two thousand правосеков to provide ph. export. Them take out, burn and dig in. I don’t know, I DON’T KNOW that to do in such situation … There is more… Today, on Monday, a mass funeral of the identified victims is expected. 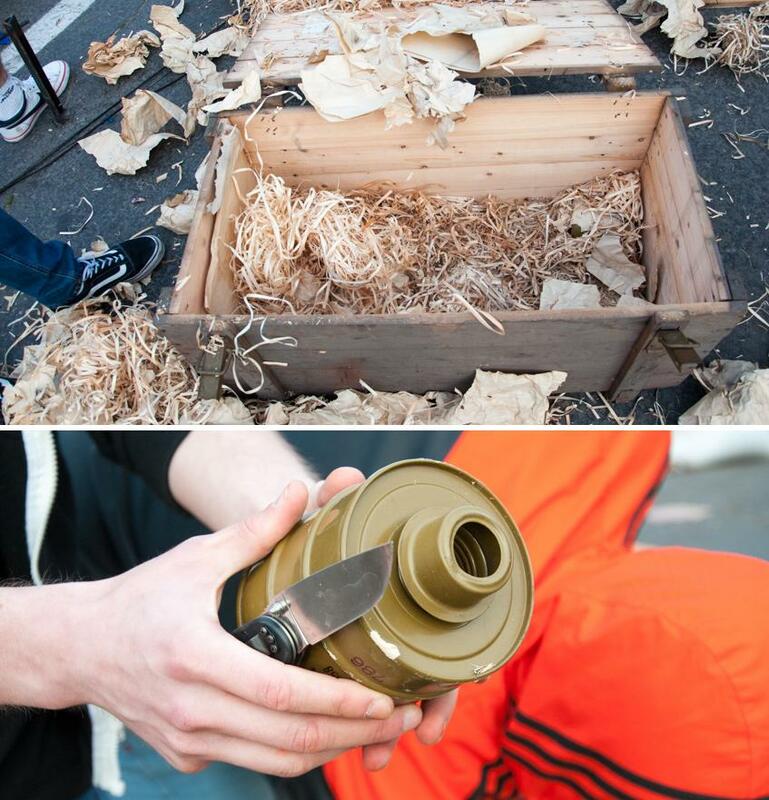 Cruel provocations directly on a funeral are planned. Be very careful. Men, despite a grief and, probably, a hopelessness, arm who than can … In Odessa war. Real war! My God, keep all of you from bad people and eternal rest innocently murdered”. … Final (whether also the final? ) the quantity of corpses in a cellar was investigated a bit later – 217. 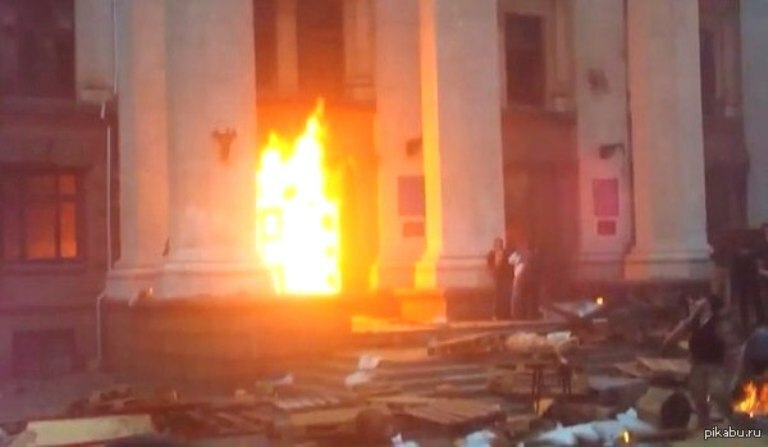 “I interviewed the inhabitant of Odessa who has survived in the Trade Unions Building. When I will make video (there are moments which I will clean for ethical reasons) — I will provide on a review. There is a material on a site From-UA. That is — the Right Sector and “football fans”, having rushed into the building, killed people at once, without any arguments. Men killed on the spot, women divided “this in hell garbage…, this in a cellar”. In a cellar of people killed. Shook — “don’t spend arms, do like this”, people KILLED TO DEATH, beat even dead though women shouted that they don’t breathe any more. The weapon at those who was inside, I didn’t see at anybody. Killed people from the gun which all who “smoothed out” had practically. “. In a cellar of people killed. I don’t divide optimism of the known journalist: NEVER we all this learn! As wouldn’t learn and about crimes of the German fascists if they won World War II if there was no Nuremberg if not six million Jews … Policy – business dirty. The original is taken from frallikhttp://frallik.livejournal.com/ in “As killed inhabitants of Odessa in the Trade Unions Building — a scenario detail …” part 3. http://napaki.livejouhttp://vvv-ig.livejournal.com/690956.htmlrnal.com/100072.html Rather in detail having got acquainted with responses to part 1, I decided to answer most often asked questions. And to carry out the detailed analysis of the photographic materials which have been laid out on a site http://napaki.livejournal.com/100072.html on March 3, 2014. Policy – business dirty. 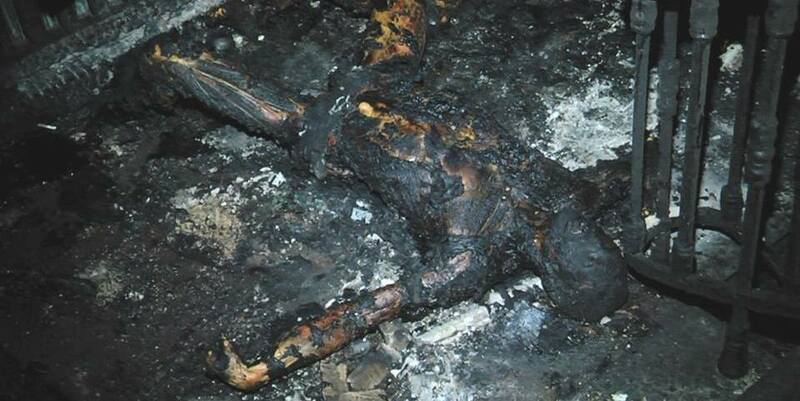 - right after sexual violence to what position of a body testifies, the woman burned. 2 . 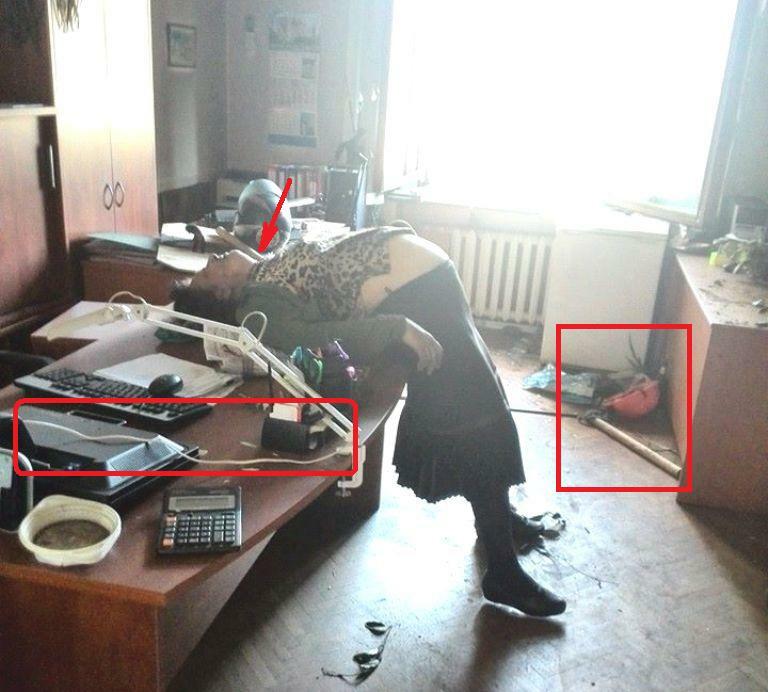 Rather female corpse (here already nobody claims that is the man) in an office — the woman of years of forty, pregnant. Pathologists could disprove my conclusions. If to remember that more than 100 people shot in Kiev weren’t subjected to inspection of judicial medical experts, the same will occur and in Odessa. LJ of mister of napaki was chosen for a throw to the necessary junta of information not incidentally. Not incidentally he was brought and in a top of livejournal. The general sense is simple — supporters of federalization fought with themselves, itself burned also to itself put injuries, hitting the heads about walls. Pictures are made from different cameras, but in chronological sequence. And “author” managed to visit different places at the same time. To Odessa. Basing by archives (the magazine is kept since 2007) the author is absolutely apolitical. Short records narrate about how to repair the apartment how to play the guitar and what music to listen, impressions of rest in Turkey + not numerous advertizing posts under the guise of sincere admiration from grades of coffee and comfort of services provided by the companies. The only political sending in 2010 — the author praised Navalny and wished that in Ukraine there was such president. Events of November 2013 — passed February, 2014 by its feather and the camera. Moreover scarcity of video records testifies that the author not really that and is interested in this pastime. Even the promise to place “numerous photos from rest in Turkey” and remained a wish. The Right Sector and National Guard under the guise of fans fans moves forward on the square to the Trade Unions Building. 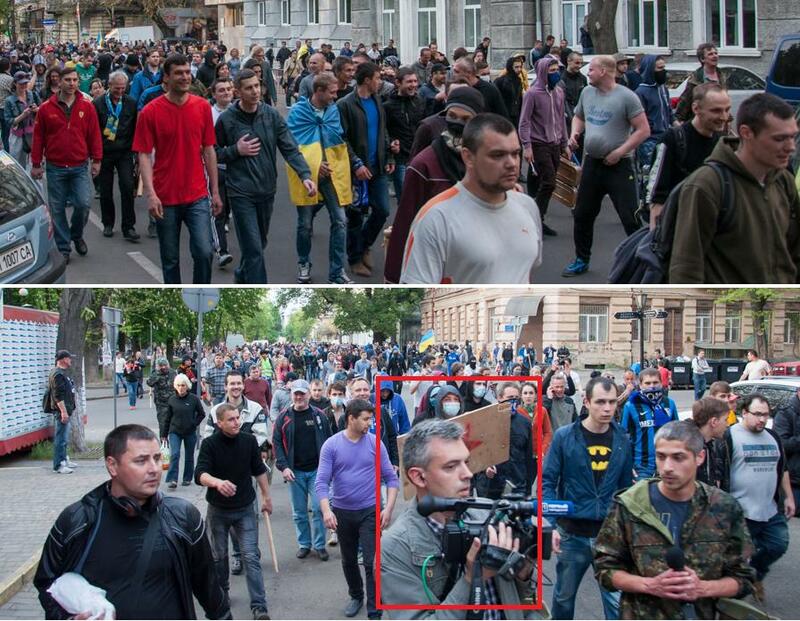 Mister with the camera will fix destruction of inhabitants of Odessa in the building. With a star we still will see a board. Here the group of “separatists” is presented — the Banderovsky attributes adjoin to a St.George’s Ribbon and a tricolor of Russia. 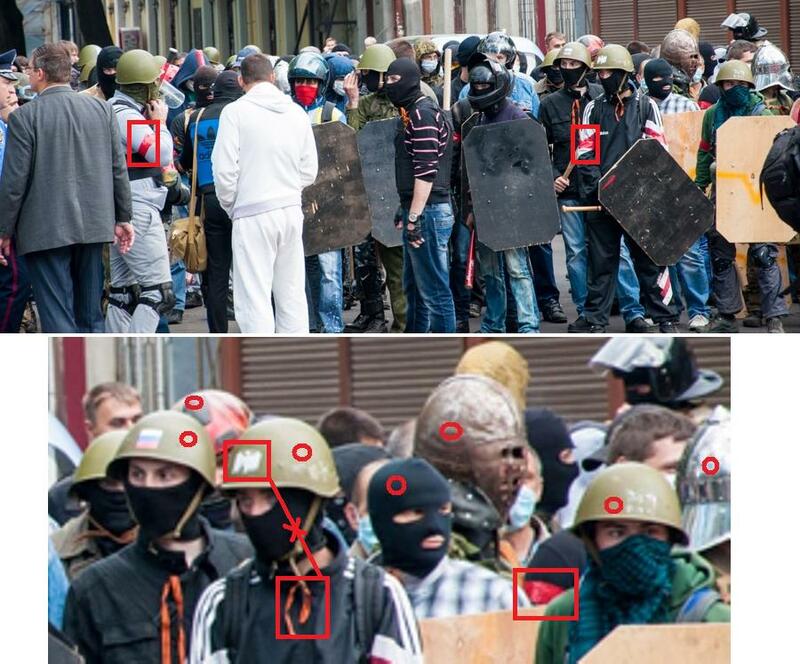 Under protection of militia they are going to attack “patriots” of Ukraine. That is fighters from the Maidan murders of employees of the Golden eagle already having experience, doesn’t raise any doubts. The muscleman in the center of the top photo to meet to us yet time. Collecting and promotion to a place of “production” fight with “patriots of Ukraine”. Confidence of behavior, protective equipment, tools of murder I testify to one — these are well paid and fighters of PS and National Guard having experience of street fights. In the first part I made the assumption that the fighter exchanged outerwear with the killed to leave the building. On the Internet there is video from which draw a conclusion that is the same person — a jacket, gloves, jeans and sneakers Excesses are possible. Up to that he was in good time sentenced by the — a shot in the right part of the person. 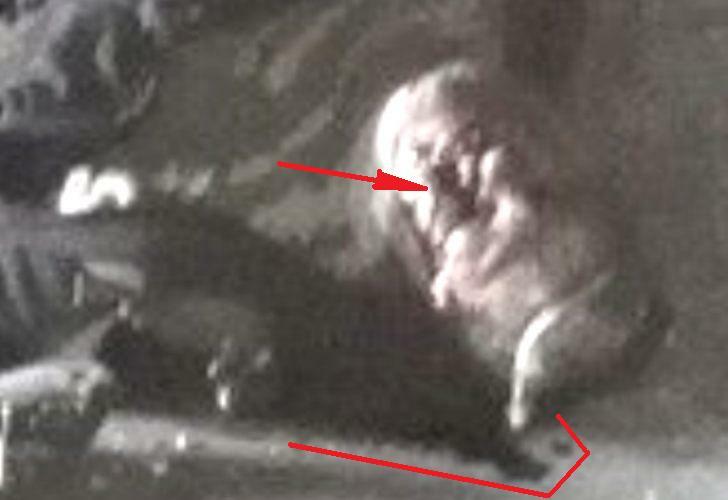 Unclear there is a black color of the head and completely remained hair. Criminal “sotnik Mykola”. Finds out by phone what to do with suddenly found car filled by AKM. And everywhere militia presence. It isn’t casual. Purely psychologically the inhabitant calms down in the presence of law enforcement bodies. Here it can be taken the lukewarm. Turchinov expanded the concept of amnesty. He signed a law on amnesty to persons in respect of which , the investigation or the court . This law allows the use of amnesty to the person in respect of whom continued pre-trial investigation and during the trial ! Lawmakers supported this law May 6, 2014 in a closed session . For a decision voted 239 deputies. Remember how MPs voted in violation of the regulations four times for holding a closed meeting – not enough votes permanently ? There was not only an attempt to throw Turchinova . And not so much trying. At the private meeting, voted for the creation of a new mobilization machine Kiev fascists. Now in punitive battalions gaining criminals , giving them amnesty. And earlier Kiev was engaged in full , but for now just summed up by armed criminals and fraudsters (remember Mykola centurion in Odessa – a felon and swindler ) framework. Revolution — it is easy, cheerful and amusing. They go to burn alive the schoolmates. They were killed for that they looked at the world own eyes. Maidan’s favorite hobby. Why they do it — after all nobody attacks them? 100% statement of manifestation of aggression, armed resistance and disrespect for a public order from outside “separatists”. In roles — the Right Sector and National Guard of junta. In broad daylight in park of the city beat the person sticks and feet — passersby perceive it as due. Anybody indignantly doesn’t react, doesn’t call to the aid militia. 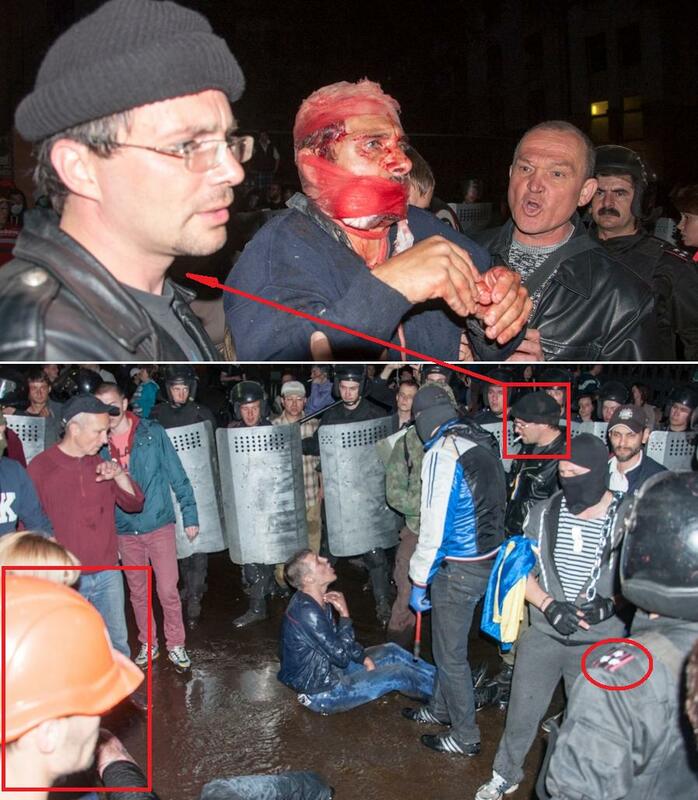 The fascist swine feels full owners in Odessa. On the first photo someone “is given help”. Pay attention, as designated mister (the citizen of Israel from Poland) fixes a body, making painful reception by a knee. It brings two hours out of the Trade Unions Building of the provoker from the backstabbers. The next provoker under the guise of the separatist is forwarded in an ambulance car. At the left in dark glasses the citizen of the USA. On this site it exercises control of carrying out operation. The police officer as confirmation that there is nothing illegal. In the crushed tents find a box with brand new filters for gas masks. Here it — confirmation of evil intention of “separatists”! But they had no gas masks. 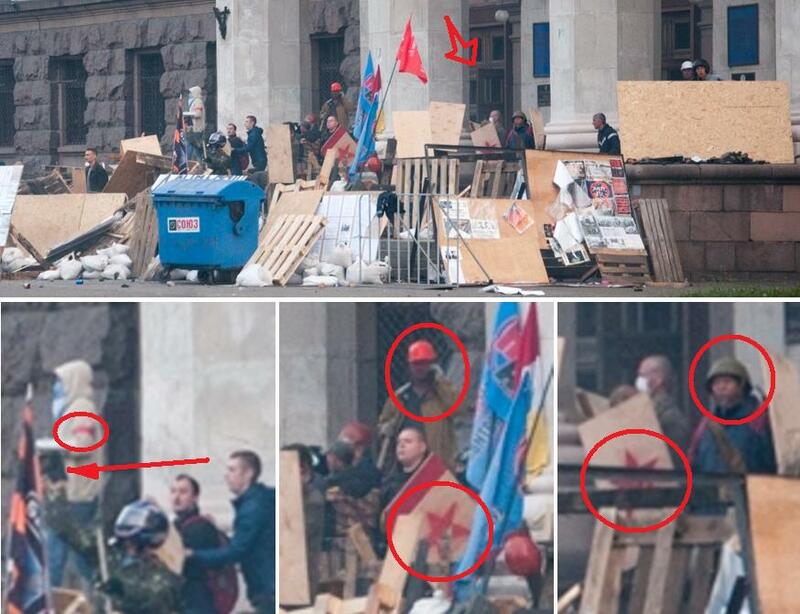 And here they were necessary for murderers bandera in the building. It is convenient — and innocent people to discredit and have a specific near at hand. 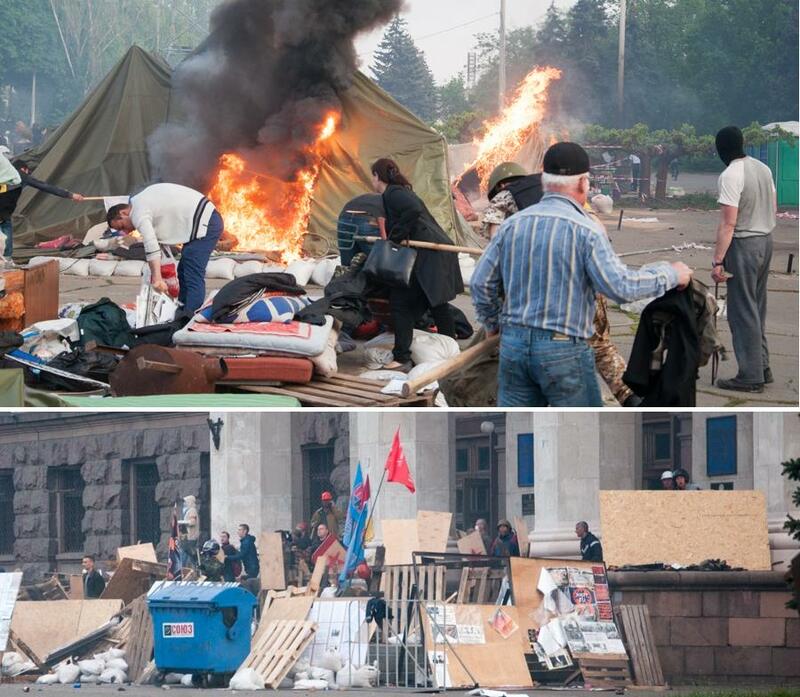 Having crushed the tent town, the Right Sector and instigators didn’t use fine opportunity to kindle a barricade before an entrance to the Trade Unions Building. Why? As they say in that joke — … well, set fire. Here and boards with stars — with them walked “fans – fans”. The door is still open, and future victims decided that they in safety. And these misters don’t hurry anywhere. Judging by movement, they won’t enter the building. 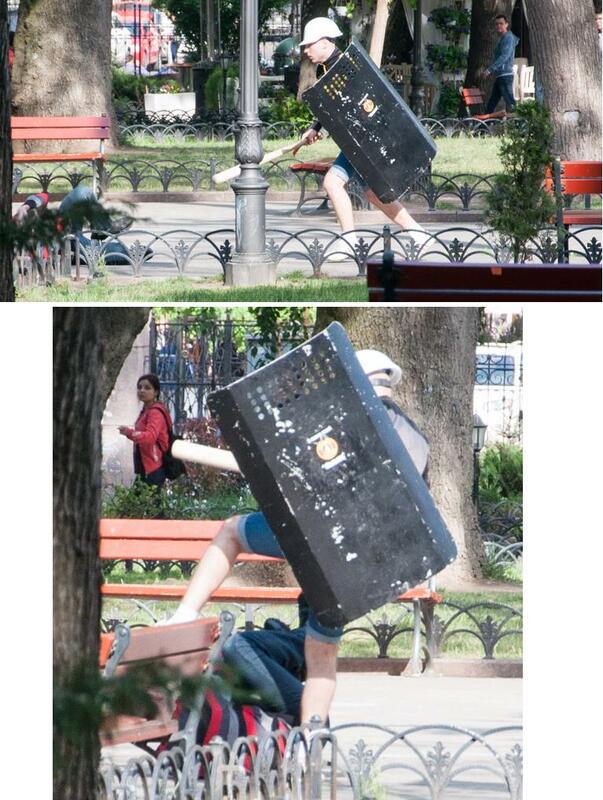 It was necessary to close a door outside, and to begin heartless beating of inhabitants of Odessa inside. Three consistently made photos. Entrance doors yet don’t burn. But, I think that beating already began. Also continued to coordinate actions when the first floor before entrance doors flared. 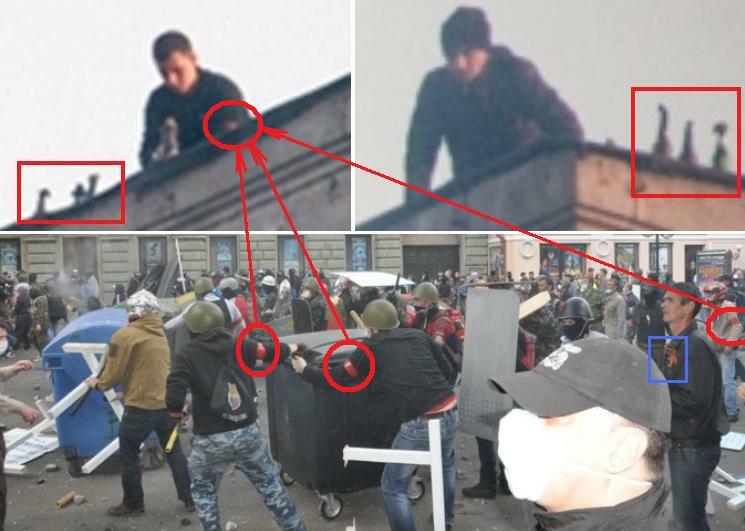 The person from the Right Sector short minutes of rest. Murder of such number of people heavy not only physically, but also morally. 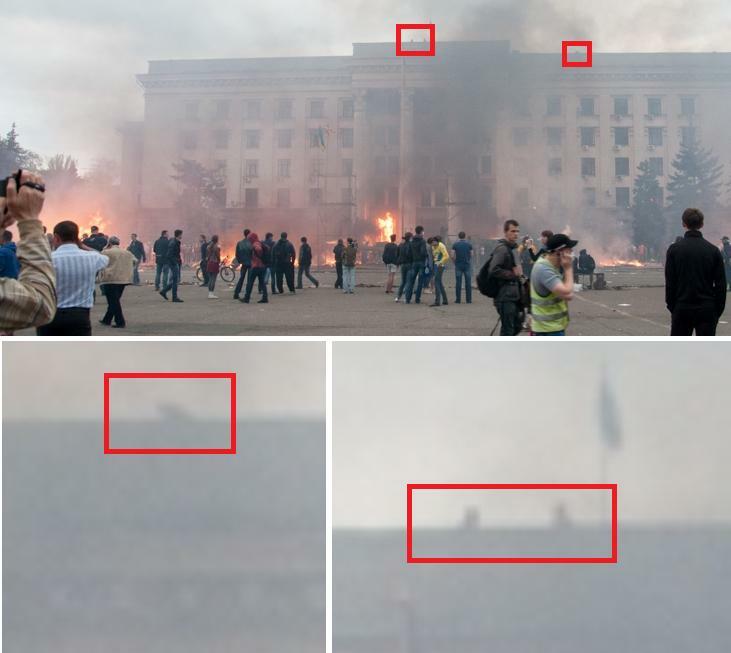 On the top photo wearing spectacles — one of curators of a slaughter in the Trade Unions Building. Presence of militia continues to make impression that all events within the law and criminally aren’t punishable. Probably, it from Poland. On the head the rolled balaclava. Orange helmet — a mimicry under “separatists”. You such already saw. From the psychological point of view they play the same role as the militia for people of comers to defend the rights for the area — “after all if there and ours anything awful doesn’t occur”. You remembered the murderer in blue gloves to a striped sweatshirt? 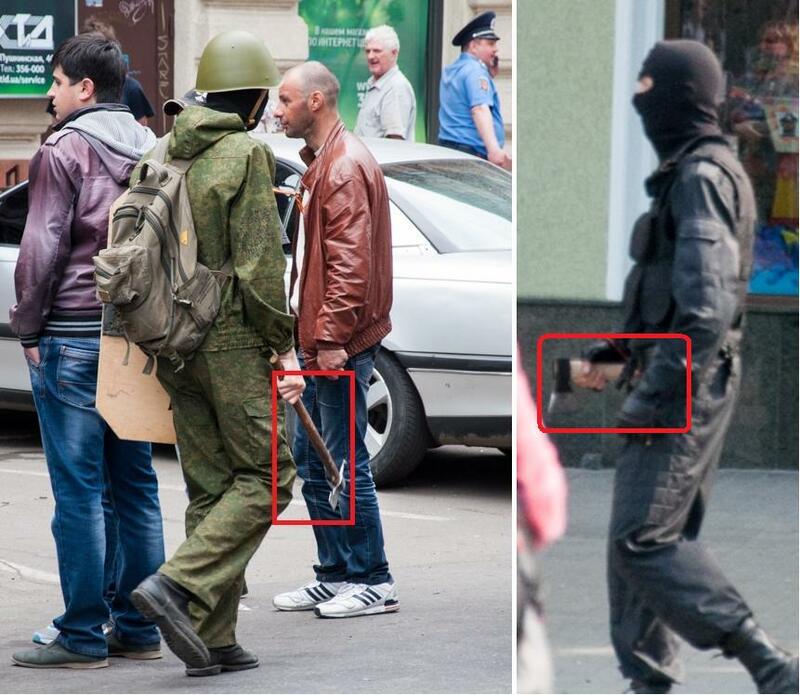 In blue gloves — the murderer of the pregnant employee of the Trade Unions Building. It is identified — Boris Reznichenko from Zaporozhye. Is engaged in fight. on May 2nd I removed the page of VKontakte. Acquaintances identified it, data are transferred to coordinators of committee of elimination of people of Bandera. Here — mini performance. “Separatist” in a bandage “bridle”. Apply at injury of a face, podborodochny area and hairy part of the head, and also as first-aid treatment at changes of the lower part of a jaw. It is made the professional, for bandage didn’t feel sorry. The separatist exchanges a look with the murderer. Then deviates sideways, and … there are proofs of aggression of separatists. As in time. Other separatists bandaged themselves, crookedly and ineptly. Here if not everything, this precisely clown. Blood imposed from above and the main thing didn’t regret that everything was on the present. And “proofs”, here they — under the camera. Here it is so possible to look at the same photos, but to explain that on them is represented, differently. And napaki gave a little money, and placed in its LJ the necessary photos with the necessary text. And for a dessert. You remember group of officers of NATO? carrying out a regrouping on the district round Slavyansk? One of them was from Denmark. 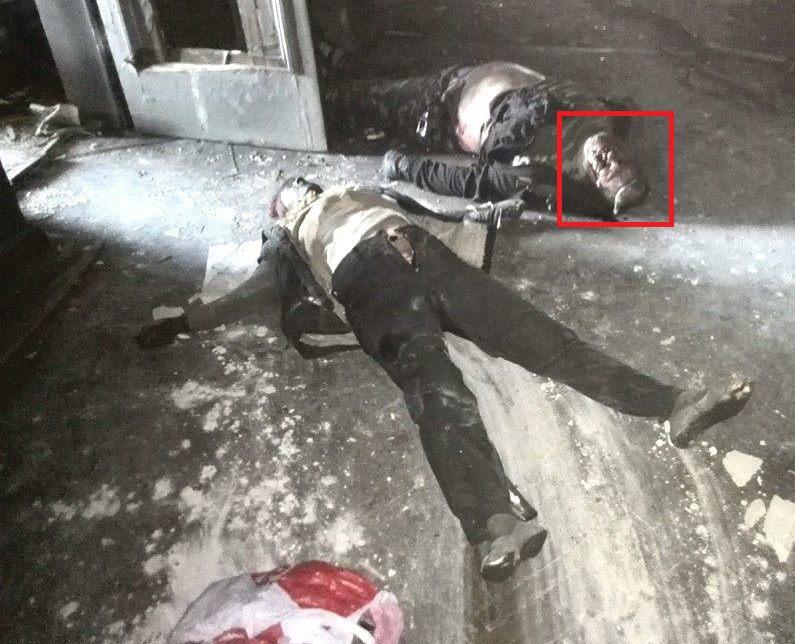 … in Kiev on February 18 — 21, 2014, sniper. And you thought, what Germans worried about the officers? 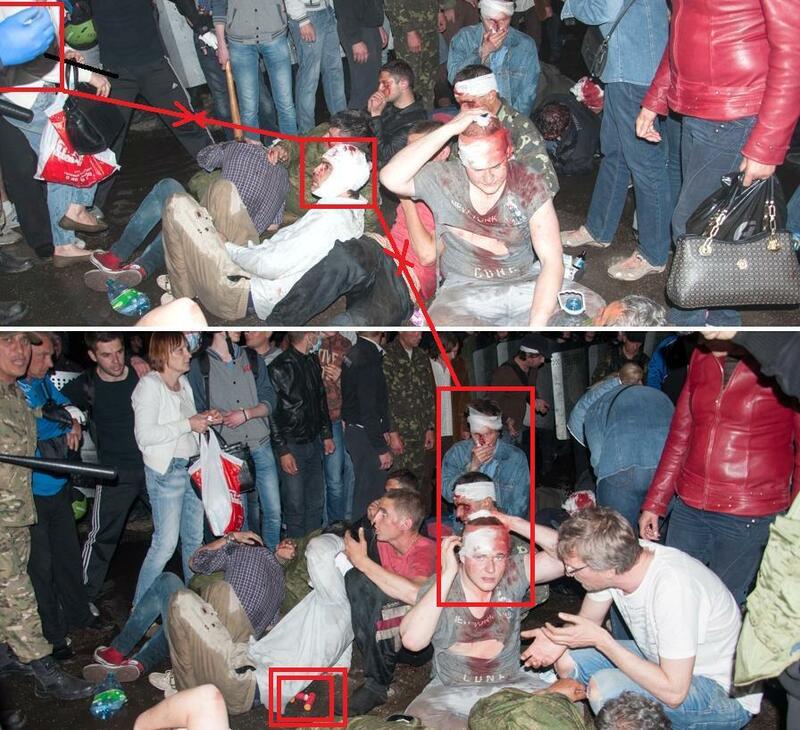 The main thing that them interested — to pull out the live witness of a slaughter on the Grushevsky street in Kiev. It arrived to Ukraine already on November 16, 2013. In vain them from Slavyansk let out. And video there is some. Odessa. 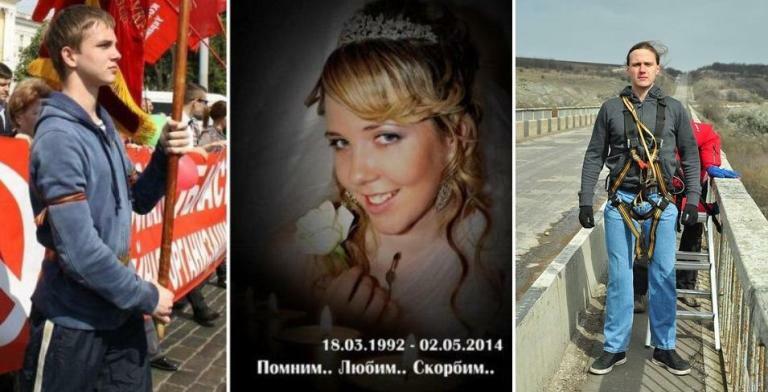 Activist of an anti-Maidan: The LOST MORE THAN 116 PEOPLE! 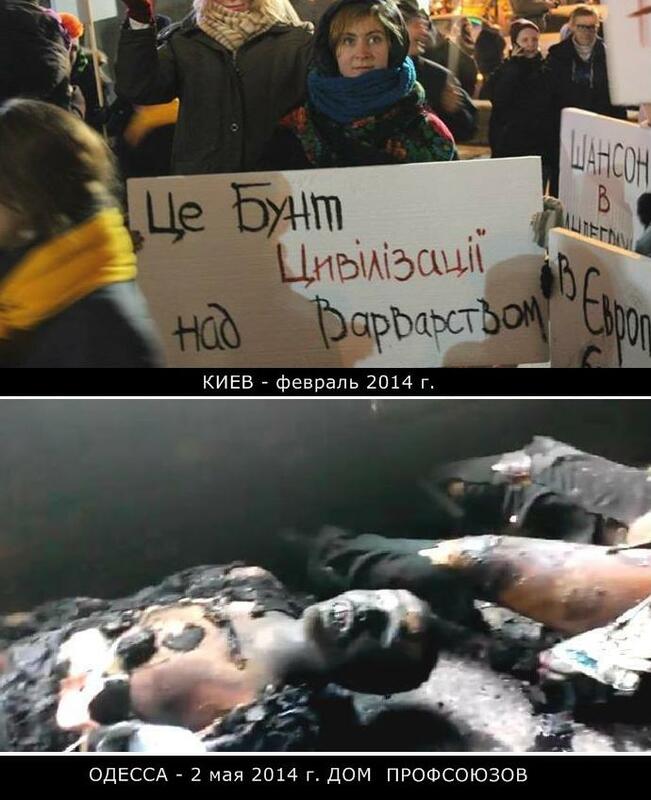 At the time of slaughter on Kulikovo field there were less than 300 people of the historical and patriotic movement “Odessa Team” and simply not indifferent inhabitants of Odessa: elderly women, former teacher of history, some children of veterans of Afghanistan, girl and boys teenagers. The most terrible weapon at these terrible separatists — is some shanks from shovels. Our girls were rescued with that they escaped behind medicines directly before in the field of Kulikovo the mad crowd of orks from the Right Sector rushed. While burned down some tents in the field and TORE TO PIECES IN LITERAL SENSE of boys who tried to appeal to shouting and guffawing crowd, a pier: “-Look, here generally women”. the handful of protesters from Kulikovo field tried to escape in the Trade Unions Building building BECAUSE THEM SIMPLY WITHOUT DISCRIMINATION CROWD TRAMPLED V ASVALT,IM PAID FOR CORPSES of the RUSSIANS, some cried out: ” – Rakhuy skilki zamochily… I fotkai, tse j groshi …”. 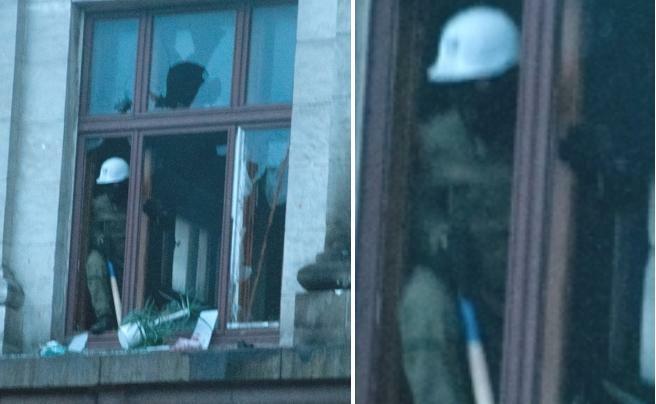 (Ukrainian: – look how many killed… and take a photo, that’s money) We were at this time on Preobrazhenskiy and came running to a tragedy outcome: to fire trucks in the beginning simply didn’t allow to pass, dragged the construction woods to shower gas mixture and in windows of the second floor. Sotnik Mikola shot from the gun on those who looked out in windows to take a sip air. 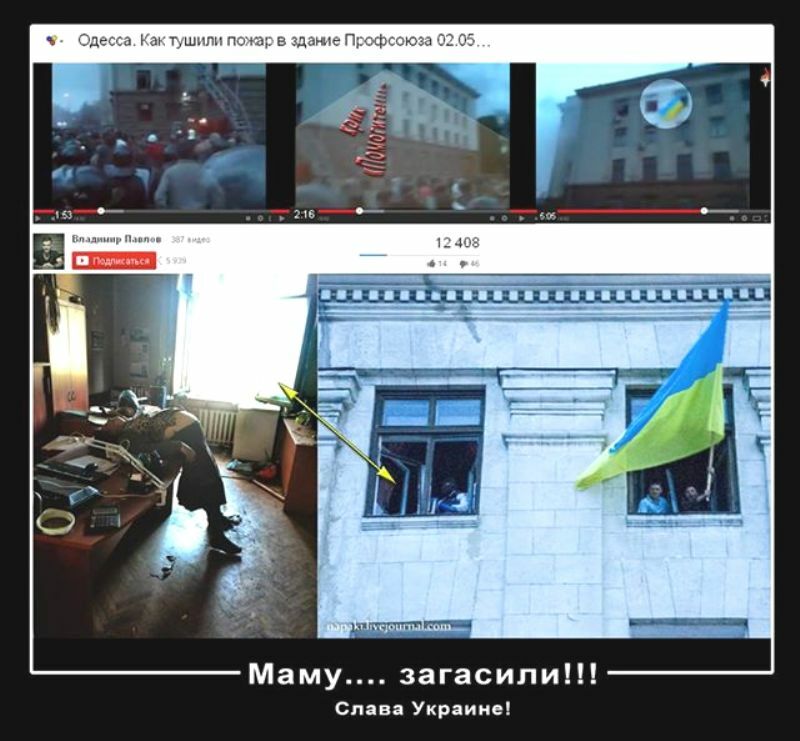 At us on eyes two benderovets threw out the girl of years of 17 from the 3rd floor with a loud laughter and cries: “-Lovy moskalku …” (ukranian: – take that russian girl) Near us the man rushed to it to the aid, told that he is a doctor … HE WAS KNOCKED WITH SCOPE ON the HEAD when it bent … And STICKS FINISHED the GIRL, chanting: “- Smert moskalyam! ” (ukranian: – death to russians) Everything who jumped from windows itself or I escaped from fire, BROUGHT DOWN TO EARTH AND KILLED. With arrival of firefighters tactics exchanged. When unblocked doors, fighters of PS broke into the building and those who was still live watered with gasoline and set fire, and then went AGAIN CONSIDERED the TROPHIES — “by bo tse j groshi! 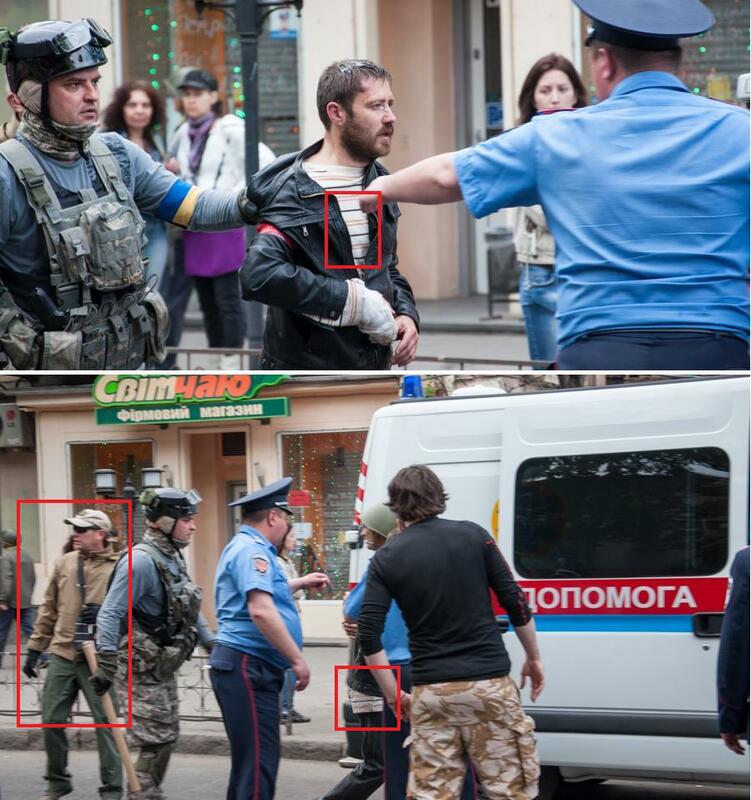 ” (Ukrainian: – same money) And IT EVERYTHING in the presence of MILITIA And OMON of the CITY OF ODESSA! 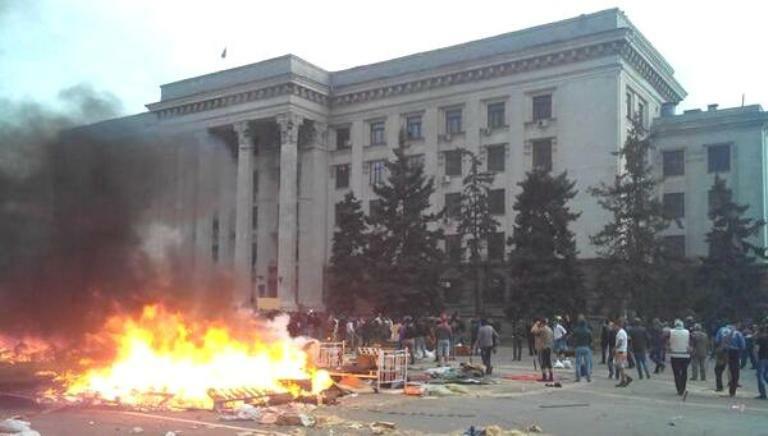 ANYBODY … NEVER … WILL not TELL YOU the TRUTH HOW MANY WOMEN, GIRLS, BOYS AND ELDERLY MEN THERE BURNT ALIVE AND BROKE OFF ON the SQUARE in the center of ODESSA, with support of the government and under the supervision of militia … AS RUSHED ABOUT INSIDE LIVE FAKELY-OBLITYE GASOLINE of the RIGHT SECTOR! from itself that occurs also other too, communicated at the Odessa forum — people are afraid to write something from themselves. Inside still let nobody. Video operators (I don’t know whose) left from there white, were afraid, them tore from the seen. Yesterday by the evening were in the building — not all are identified on their hearings there 150, spoiled with traces of tortures огнестрелами, without eyes, on hearings, will deliver directly there zinc coffins — to solder and give out whom identified. Now Odessa is blocked on entrance and departure by nazis. Why? which survived inhabitants of Odessa the rebelled golden eagle released next day are live witnesses of massacre of inhabitants of Odessa fascists. For last days in Odessa from those who was released by a golden eagle is killed or about 20 people were missing. 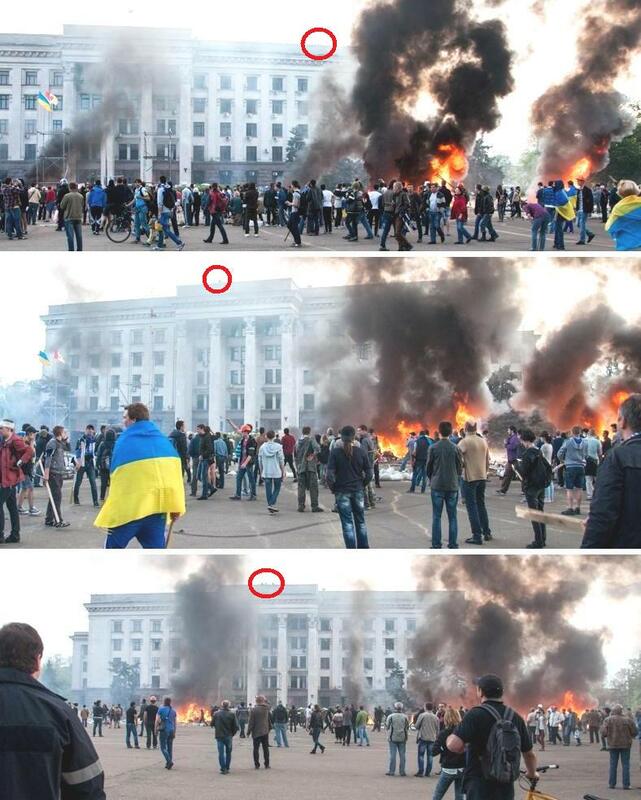 On city streets kill directly in broad daylight, kill just as on a Maidan hammer discordant in Kiev. 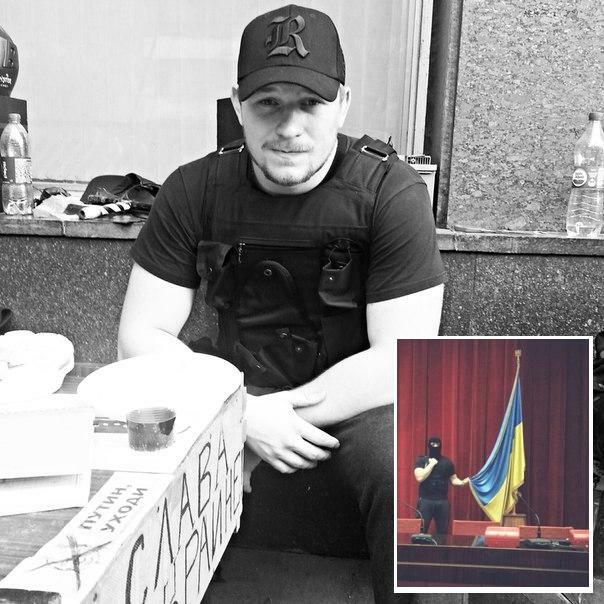 The supporter of federalism of Ukraine released the day before Vitaly Chudko is killed in Odessa, report the Ukrainian mass media with reference to a source in law enforcement agencies. Both Fascists and the guerrilla militia now conducts hunting at each other. All this circus with involvement of mercenaries from Germany, America, Italy is necessary to badmouth normal people. And so-called ANTI-TERRORIST operation in the southeast turned in fact into full-scale war and a slaughter where people kill crowds I I don’t tell about rebels the majority them them this is a golden eagle, militia and internal troops come over to the side of the people. 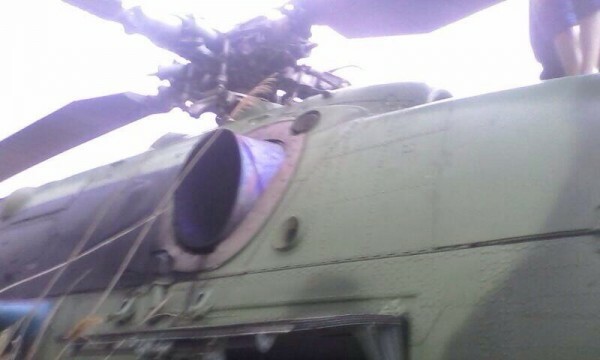 In the suburbs near Slavyansk after fighters of a militia escaped from an environment and destroyed the helicopter mi-24, fascists to compel a militia to come to the help to villagers shot all without discrimination including children. 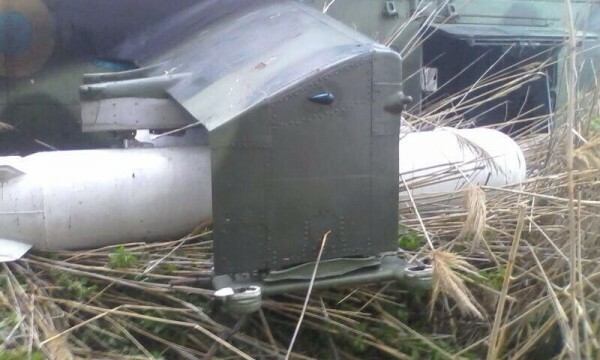 Pictures of the Mi-24B helicopter brought down on May 5 near Slavyansk. It seems as the helicopter was armed with G PTUR “Shturm-V”. 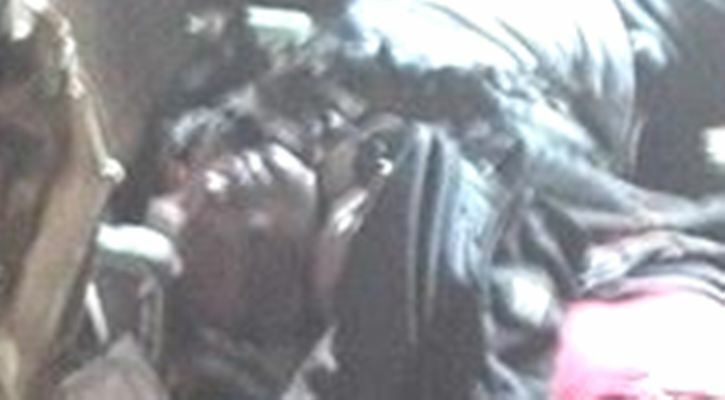 Pictures are made during evacuation of the pilot after falling and before possible destruction from air. 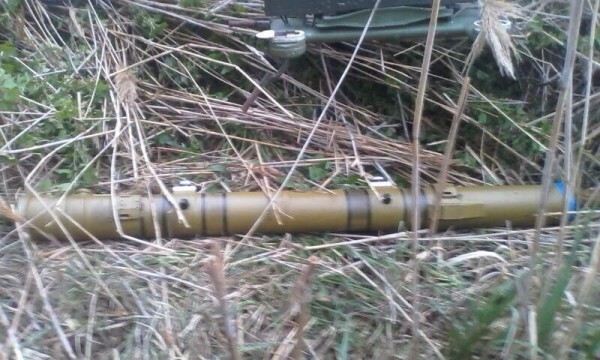 NURS and ammunition were removed and taken out to Slavyansk. 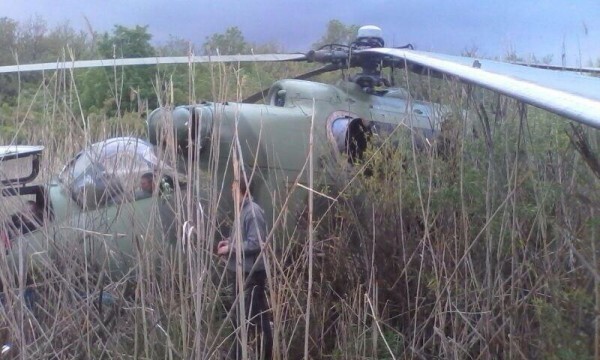 A bit later the aircraft destroyed the thrown helicopter. 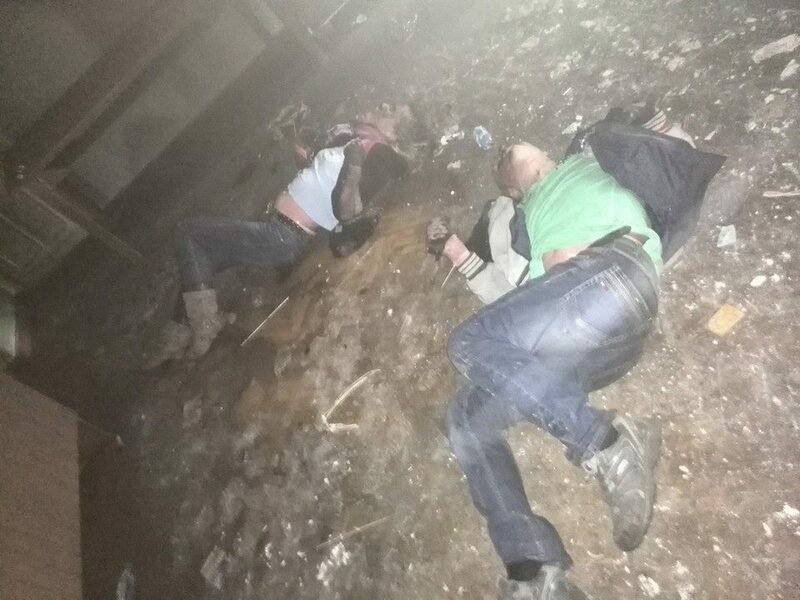 “In Andreevk’s settlement (the suburb of Slavyansk) last night people send to bar the way to the “Right Sector” column, created a live chain, however fighters of “Right Sector” opened fire therefore more than 10 people were lost. 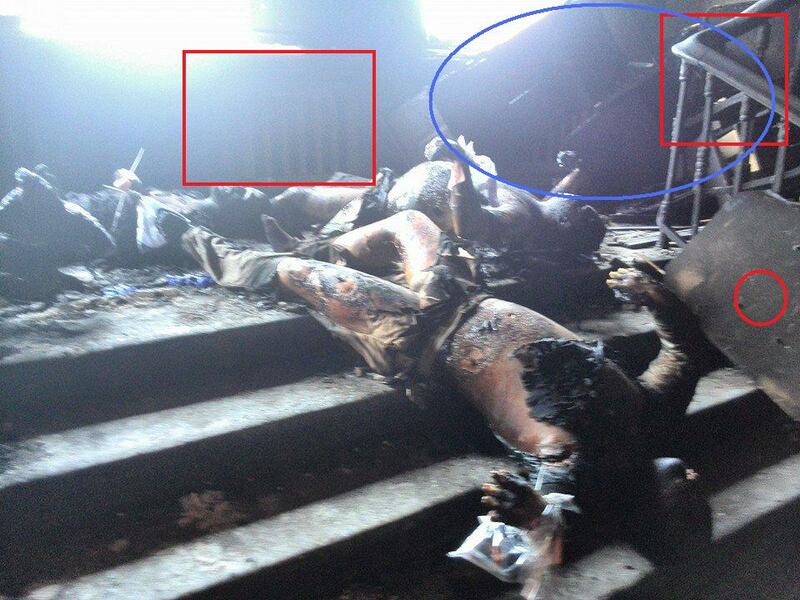 Besides “Right Sector” didn’t allow to take out wounded and opened fire on all coming nearer to victims. 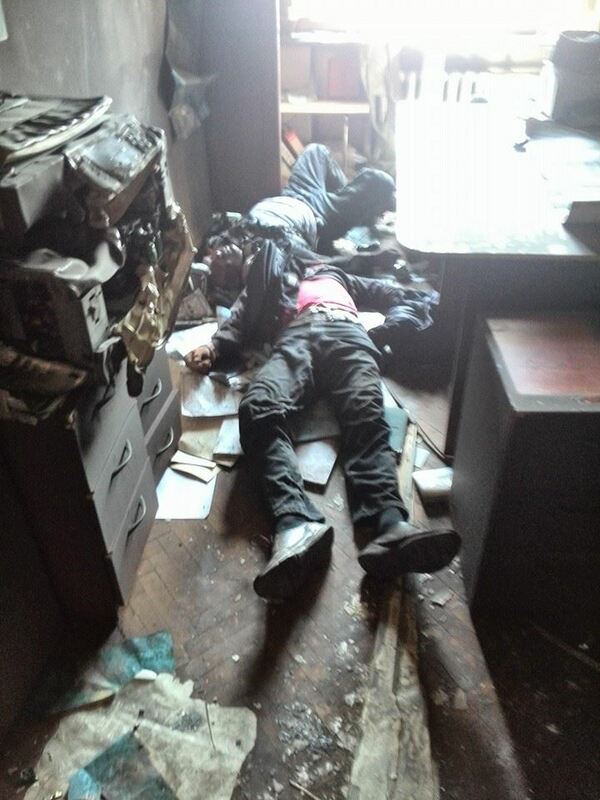 That is, it at all fight was” — the national mayor of Slavyansk Vyacheslav Ponomarev told “Interfax”. The captivated fascists cutting a throat to the veteran. For those who still doesn’t understand — here these bastards idolizing fascists cut old men. 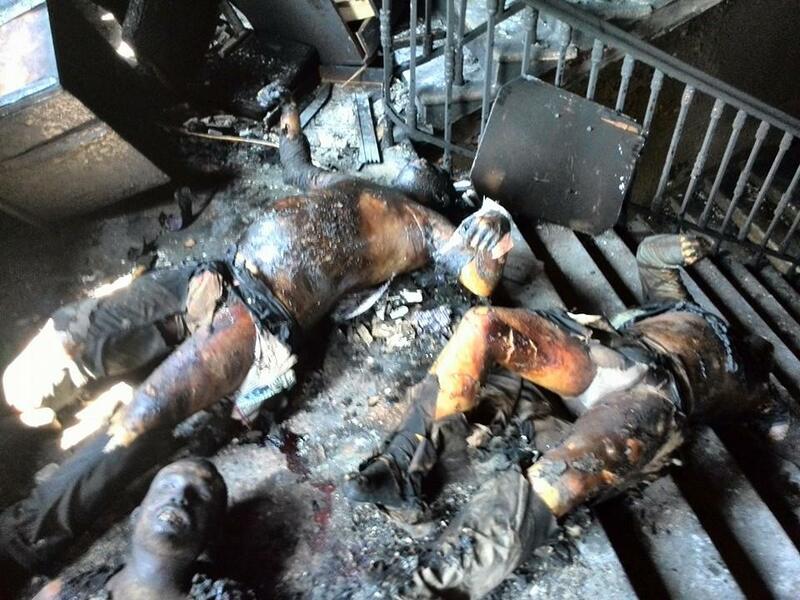 In Slavyansk kill peace people in suburbs. Come into apartments on suburbs and kill. for those who still doubt the crimes Stephan Bender. Fascist Stepan bender - on whose orders the Nazis killedhundreds of thousands of undesirables. Picture 1 - ZAMOYSCHIZNA (ZAMOJSZCZYZNA), Lubelskie voivodship (woj. lubelskie), 1942. Corpses frozen unknownPolish children - teamwork Nazis and Ukrainian chauvinists perform thorough due secret plan ‘Generalplan Ost (GPO’), and ‘Ukraineaktion’. Photographer unknown. (za: Jacek E. Wilczur, Nie przeminie z wiatrem: Ojszyzna nie udziela urlop? w), Warszawa 1997, Agencja Wydawnicza CB Andrzej Zasieczny, s. 199). Photo 2 - Tarnopol (TARNOPOL) - Silesia tarnopolskoe 1943 (?). One of the trees country road on which terrorists UPA(OUN-UPA) hung a banner with the inscription translated into Polish: ‘The road to independent Ukraine. “At each treecreated executioners of the so-called Polish children wreaths. Photographer unknown. Photo published thanks to Vladislav Zalogovichu. Photo 3 – Lipniki (LIPNIKI), county Kostopil voivodship Lutsk. March 26, 1943 . 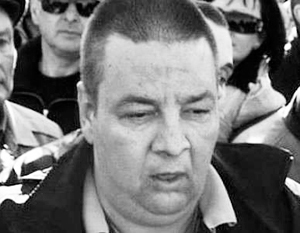 Resident colony Lipniki – Jakub Varumzer without head , the result of the massacre committed by terrorists under the cover of night UPA (OUN-UPA).As a result of the massacre of Polish Lipniki killed 179 people, as well as the neighborhoods of Poles seeking shelter there . They were mostly women , children and the elderly (51 – aged 1 to 14 years ), 4 sheltered Jews and one Russian .22 people were injured . Identified by name 121 Polish victim – Lipnik residents who were known to the author . Also lost their lives in the three aggressors. Photographer Sarnowski – the above picture, and further on Lipnik . The above photo and the following related to Lipniki published thanks to Alexander smoking . Photo 9 - Lipniki (LIPNIKI), county Kostopil voivodship Lutsk. March 26, 1943. Central fragment mass grave Poles -Ukrainian victims of the massacres committed by the OUN - UPA (OUN – UPA), - before the funeral about the People’sHouse. Photo 13 - KATAZHINOVKA (KATARZYN? WKA), Lutsk county, province Lutsk. 7/8 May 1943. The plan has three children: two sons, Peter and Annelie from Meca Gvyazdovskih - Janusz (3 years) with broken limbs and Marek (2 years), bayoneted, and in the middle lies the daughter of Stanislaw and Maria Stefanyaka Boyarchuk - Stacia (5 years)and with sliced ​​open the belly and the guts out, and broken limbs. Crimes committed OUN - UPA (OUN – UPA).Photographer unknown. Photocopy of original A - 6816 published through the archive. 1. 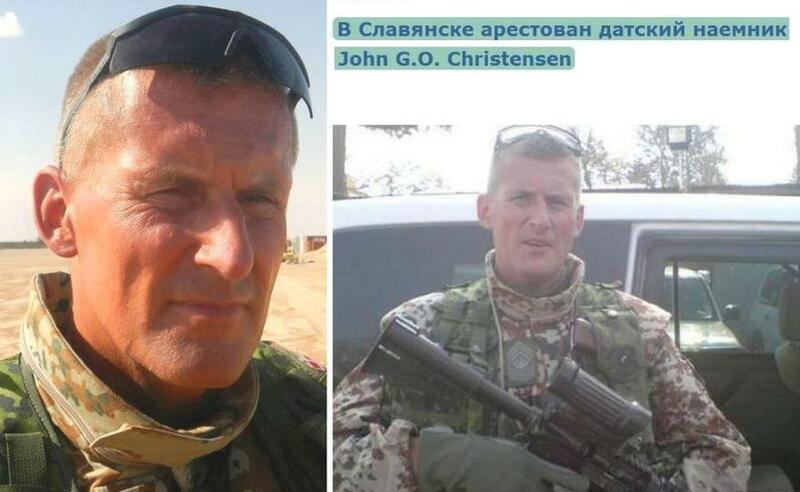 Mercenaries from NATO ALREADY Ukraine. They wear uniforms Ukrainian military and fight together with the Nazis. Shaming the country and the army of the country to which it belongs . 2 . Government of the USA, France , Germany and Italy are sponsoring FASCISM in at least four countries, the Baltic states . Moldova , Lithuania, Estonia , Ukraine and who knows where else . 3 . Everything that happened is happening at the behest of the above countries the hands of the Nazis. ALL law enforcement agencies , police , Power Steering, special battalion , special forces and National Guard consists of the Nazis. Massively loyal militia fired and replaced by the Nazis. In disloyal army units puts commissioners and threatened reprisals forced to obey orders . Nazi commissars bodyguards forced internal troops follow orders . 4 . Due to all the above items are directly leaders and participants in Kiev Slaughterhouses subsequent genocide and persecution in Odessa. So MOST guilty of what is happening. NATO countries ALREADY in Ukraine. They wear a uniform of the Ukrainian military. Why Russia won’t enter there army? correctly because it declare an aggressor and will blame it. 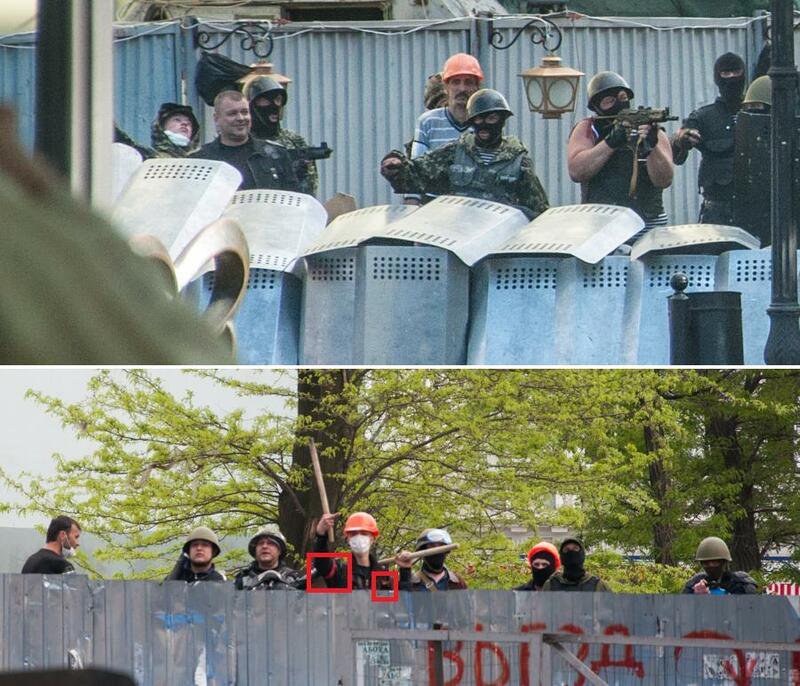 In too time in Ukraine every day catch “GRU FSB SPECIAL TROOPS” but never it was true. 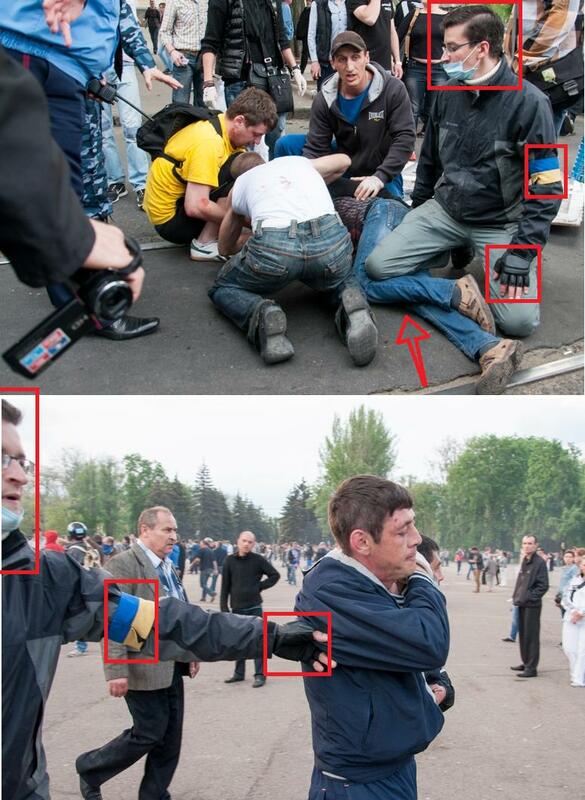 The U.S. Government, France, Germany and Italy sponsor FASCISM in Ukraine and all event of their hands business. They have hands already up to an elbow in blood. 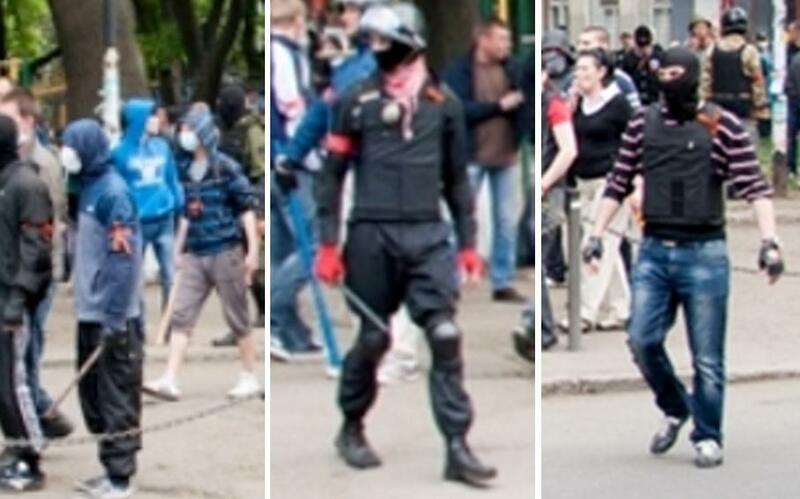 They are direct participants of the Slaughter in Kiev and the subsequent genocide and prosecution in Odessa. Now YOU read this wall of the text on that party of the screen know that monsters came to the power fascists, what you will do? Share this information with all the acquaintances. And you will help to win against fascism. PS … until I wrote it in Mariupol in broad daylight, the Nazis executed 15 people in the city center. 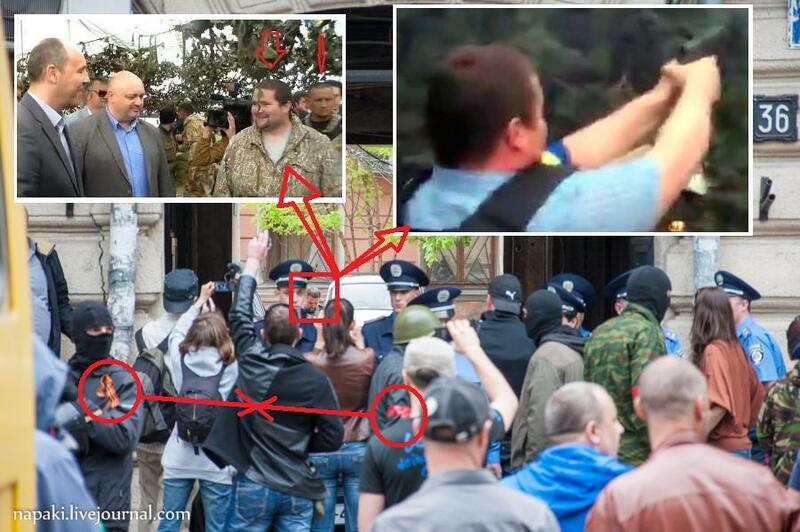 Very clearly shows that no armed militia, which is fighting in his facebook Avakov was not close. There was a crowd of civilian who tried to compensate for the lack of weapons and the number of desperate courage. WARNING!!!! 18+!!! NACI KILLING CIVILIAN!!! that was really the case? Ukraine abolished everywhere victory parade and renamed it the day of memory of the fallen soldiers . at one of these meetings in the city of Kherson Mayor stavlenik Turchinova direct text said – quote – “Stalin a fascist ! Hitler our liberator ! ” After that, the crowd explodes townspeople storm of protest and a woman with a child from the mayor selects microphone and throws it. Mariupol in spite of the ban decided to spend your day of victory . 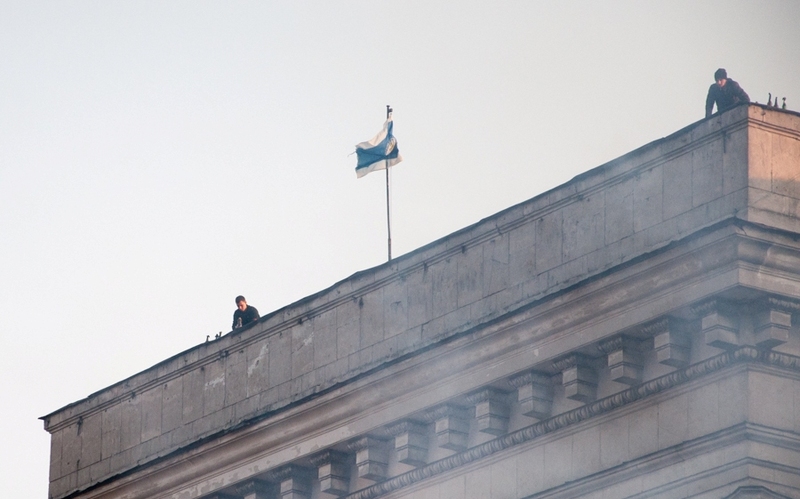 On the new police chief was ordered to disperse from Kiev victory parade . Policemen refused to obey the order and the chief of police opened fire on the officers seriously wounding one . Sheltered and zabarikadirovalis in the office , he called on the checkpoint to the National Guard. The Nazis were sent to the city 6 and BMP 1 APC loaded with infantry. City residents blocked the road to the Nazis. Nazis dug fire. 2 BMP stragglers from the column did not dare open fire and residents emboldened drove the Nazis. In the video, when they kill civilians seen as lagging Nazis flee their way through . After the first shots citizens begin to stream online shooting in Donetsk and several trucks with infantry militia parade goes right with the aid of Mariupol . The video shows how the Nazis under the fear of violence on the BMP punch barricade at very high speed . Infantry about 150 people took refuge in the hotel. They subsequently disarmed militias drove up and deported from the city. WHERE LIES THE TRUTH AND WHERE?